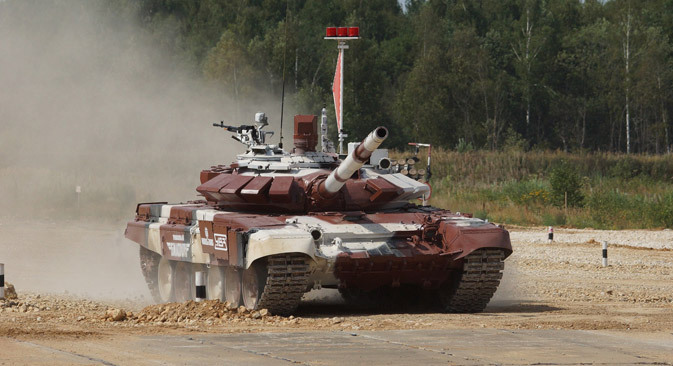 The first official Tank Biathlon World Championship began on Monday, August 4 at a firing range in the Moscow Region. The competition, which puts tank crews through their paces on a 4.5-mile course, is being attended by representatives of 12 different countries. At a military training facility 30 miles outside Moscow, an unusual new international biathlon is taking place for the first time. Like an ordinary biathlon, the event features racing and shooting, but here the competitors are not athletes, but tank crews from around the world. The world’s first official tank biathlon championship, which began on Monday, August 4, at the Alabino Firing Range, is being attended by crews from 12 different countries: Angola, Armenia, Belarus, Venezuela, India, Kazakhstan, Kyrgyzstan, China, Kuwait, Mongolia, Russia and Serbia. Speaking at the opening ceremony of the championship, Russian Defense Minister Sergei Shoigu described the event as of great importance for the military-industrial complex. “The constructed course will not only determine the level of crew training, but also test the strength of the armored vehicles,” said Shoigu. Shoigu also made it clear that the event could be seen in terms of developing stronger political and military ties with the participating nations. “Faced with the complicated international situation, the upcoming competitions are designed to promote trust and understanding between the armed forces of different countries,” said the defense minister. “This championship is a testament to the desire and willingness of Russia to work on the development of inter-state partnerships in the military sphere,” said Shoigu, making it clear that the countries currently participating can be seen as Russia’s current and potential partners in military-technical cooperation. The current Tank Biathlon competition is being held in four phases: individual races, 3-kilometer (1.86 miles) sprints, pursuit and relay races. Each member state is represented by four tank crews – three primary ones and a backup team. The 4.5-mile-long track includes a high-speed section, firing ranges, and a variety of obstacles, such as passage through minefields, two uphill slopes, an anti-tank ditch, an obstacle and maneuvering course, mounds, two escarpments, fords, and a model of a track bridge. Despite upbeat statements by the crews of the various countries about their readiness to win the prizes, the first day of the competition showed that the Russian tank crews were still a cut above their rivals. From the stands, it was clear that the Russian crews were performing the exercises more precisely, quickly and confidently compared with the visiting teams. Perhaps in the course of the championship, this situation will change somewhat, although breaking the trend set on the first day is quite unlikely. After the first day of the competition, the results of the individual racing determined four leaders: Russia, Armenia, China, and Kuwait. The first international tank biathlon, with the active support of the Russian Ministry of Defense, was held one year ago. The resounding success of the event gave birth to the idea to create a full-fledged international tank biathlon as a form of bona fide military sports competition. A large number of countries expressed a desire to participate in the international championship, including a number of NATO states. It was assumed that the teams would be able to compete using their own combat vehicles, which would further increase interest in the discipline. However, as a result of the aggravated situation in the foreign policy sphere and the refusal of the North Atlantic Treaty Organization to participate, the championship participants are competing in Russian T-72 tanks. However, the rules of the tank biathlon do not prohibit tank crews from using machines of other brands – and it is this that has provided one of the main intrigues of the 2014 championship – the Chinese team arrived in Alabino in their own Type 96A tanks. Put into service in 1997, the Type 96A forms the foundation of the Chinese army’s armored units. Markedly different from the T-72, the machine is 5.5 tons heavier than the Russian tank. However, its maximum speed (40 mph) exceeds that of the Russian machine by 3 mph. The Chinese high-speed tank sports a boosted 1,000-hp diesel engine. This engine is a further improvement of China’s diesel tank 12150L7-BW, and thus continues the line of the Soviet V-54 engine. The Type 96A gun is an exact replica of the Russian 2A46M gun. Ammunition – 42 shells, 22 of which are located in the autoloader. Like in the Russian tank, the Chinese firing rate of the gun is eight rounds per minute. The main differences between the Type 96A and Russian machines lie in their appearances. The Type 96A has a characteristic angular shape, thus slightly reminiscent of the German Leopard 1. During the competition, the Type 96A has so far showed good fighting and technical capacity and demonstrated itself the equal to most of the other machines involved in the championship. The unfortunate loss of a caterpillar track kept the Chinese from overtaking the Russians in the early phase of competition. Like last year, each member of the winning crew in the finals will receive a new car from the Uralvagonzavod (UVZ) Corporation as a prize. This time the prize vehicle will be a fully-equipped Russian SUV – UAZ Patriot. The keys will be handed out to the winners on the last day of the competition, August 16, after the results of the championship are tallied.